I’m in Taiwan this month to study Mandarin. During breaks, I’ll be posting occasionally about the island nation’s demographics, politics and (sticky) weather. Like other East Asian democracies, such as South Korea and Japan, Taiwan has a rapidly aging population, posing demographic and economic challenges for policy makers. One reason for the age increase is that Taiwan has among the lowest birth rates in the world. These charts highlight the trend. This week the U.S. Census Bureau released updated national population estimates, including a list of the counties that grew most rapidly from 2010 to last summer. I wrote about these counties in a political context this week for work. Included in the release was a note that six more counties had flipped to “majority minority,” as the bureau calls them. 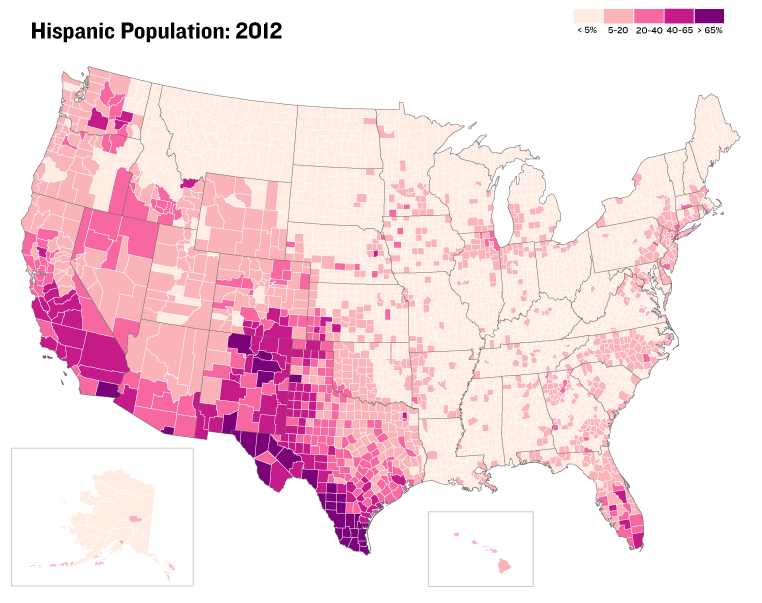 These are counties in which non-Hispanic whites represent less than half the population. These counties exist largely because because of the relative size of the Hispanic and black populations (though Hawaii and Alaska have high Asian population rates), depending on geography. Western counties have higher percentages of Hispanic residents, and counties in the Deep South have higher rates of black residents. Of course there are some exceptions sprinkled throughout the country. You can download the data here. Tomorrow we’ll examine how these counties voted in the 2012 presidential election. For more updates, follow me on Twitter. The Houston region is now the most ethnically diverse large metropolitan area in the country, surpassing New York City. Two suburbs – Missouri City and Pearland – have become even more diverse than the city of Houston. Other suburbs aren’t far behind. Read the full report, which compared the number of demographic groups and their relative size, here [PDF].